Biography: Thorn was born in the town of Bastion Hollow, a small village up in the mountains. His childhood was that of a normal boy until he reached the age of sixteen, when he was levied into the army. He served for ten years of his life, during which time he learned to kill without pity and that those who cannot keep up in life are simply left behind. Finally at the age of 26 he was allowed to leave the army, however he was a changed man and realized his family would not understand him for what he had become. So since then he has wandered throughout the land trying to find purpose and survive. 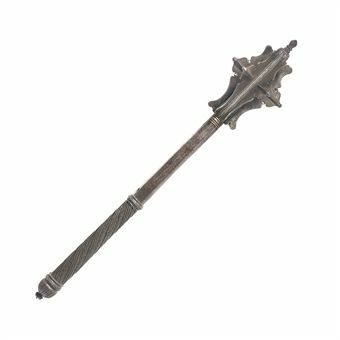 Update Recently Thorn located some Stygian armor in a merchant's caravan that was raided by bandits while he was on patrol. He decided it looked to be a fine suit and now wears it seemingly non stop. As if by chance he has also changed. Originally he joined the Royal Guard to protect. Now, he isn't sure. It seems as if all he wants to do is fight, to kill. In secret he had always admired the tough as nails captain, but upon her leaving he began to doubt the reason for him being here. Since he left his old home for the army he has no friends, no one to care for...no one to love. All this plus fight after fight have turned him into a shell of what he once was. He lives simply because he can't imagine death being much better, he fights for enjoyment, he has no one. 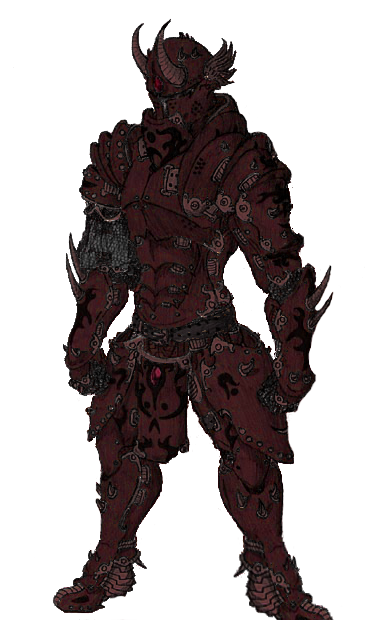 There is nothing left of the man underneath the red Hell-forged Stygian armor that has seemingly become a part of him. Part of him wants to find someone to care for, someone to be with, but that is such a small part he never even takes notice. Update Update Five years has passed since the defeat of the false Prophet of Tyr by Thorn and things have slowed down for the most part. Time seemed to slow him down, calm him, pacify him, though all the calm that has surrounded him over the past five years is even now being undone with the recent events he has reverted to a more sadistic, playfully evil and bloodthirsty demeanor, though around his wife Shelob and their child, he does manage to keep a peaceful air for the most part. Biography: Harbavul is the demonic entity that resides in Thorn's Stygian armor and is currently possessing his body since Thorn's soul was taken by Shar to the void. He was once a Banespawn in the great war, until he fell and was left buried under the ground for millennia until he was discovered deep underground by miners and eventually made his way to Thorn. Personality: Harbavul at one point was nothing more then a blood crazed berserker, wanting nothing more then to slaughter everyone he could. However, after killing Thorn's adopted son, Saren and aiding him into his assent to Demi-God he was cast aside by his master, Bane. Since then he was confused, unsure of what to do, besides harbor a deep hatred for his former master. Eventually he met a girl named Claire, and for the first time he felt he had a life to live and a purpose. He started making subtle changes to himself, becoming calmer over time. Ironically, both he and Thorn's mortal enemy, Zayl Rathman and he (with others) were attacked by Phobia and drawn into the Otherworld. Harbavul revealed that he didn't want to kill Zayl, simply stating that it was too much fun. However, after the two were forced to work together to defeat Phobia the two became what could be considered "Friends". Since then Harbavul has become cocky and arrogant as opposed to bloodthirsty and insane. He cares little towards others, however on occasion he seems to be understanding and sort of kind, probably due to his grip over what bit of Thorn in him being weakened. Oddly enough he as seemed to be considered a sort of 'hero' by some, which he finds ridiculous, as he sees himself as everything a hero is not. Stored for posterity, Rutabega's first words on Olden. Note this is just as I left it eons ago. I don't plan on touching it, I just didn't want to lose it should the old forums go under. In the event of me actually updating (god forbid) this character page I'll probably make a whole new post and put this one into the archive.